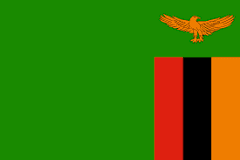 Zambia is a landlocked country located in Southern Africa. It has an estimated population of about 16.2 million (2015). The population is concentrated mainly in the capital city, Lusaka. The country had 10.5 million mobile cellular lines (2012), which is expected to go up year by year. There were 816,200 Internet users in 2009, which rose to 1.9 million users by 2012, which is about 13.5% of its population. Zambia has legalized three types of gambling; sports betting, casino and lottery. Given the extremely low Internet penetration in Zambia online gambling has not widely spread to be specifically regulated by the act. Lottery is a state monopoly in the country. Zambia lotto (Zamlotto) runs lottery network in the country. Zamlotto started its operation from August 22, 2008, and has a valid license to operate lotteries up to 10 years. The Zambia state lottery offers no online platform for gambling, the website they have allows only players to check the game results. Online gambling is not addressed in gaming laws, but there are some offshore online gambling sites that accept Zambians. The biggest jackpot won by a person was an amount of 78 Million Kwachas ($15,015) after sharing an 858 Million Kwacha ($165,165) jackpot with eleven other lucky participants. Lotto draws are televised every Tuesday, Thursday and Saturday evening on Muvi TV.